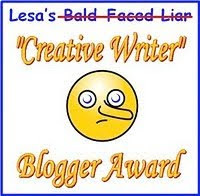 I had hoped that I'd be able to escape the "Creative Writer" Award, as it did its rounds, but VR Barkowski must have known that I was trying to keep my head down, and passed it along! According to VR's blog, I am now forced to tell you six outrageous lies and at least one outrageous truth. I feel rather unequel to this task, I have to admit, and I'm not sure where to begin-- but maybe that's the point! Sometimes we all need to stretch ourselves to meet the challenge of writing something we're not sure we can, and I'd like to thank VR for giving me this challenge! 1) I spent the first two years of my college career actively trying to repel my now-husband. Needless to say, it was not love at first sight. 2) Rod Serling of Twilight Zone fame was a close friend of my Grandmother's. 3) I convinced my parents I wanted to go to the University of Alaska, Fairbanks, so that when I told them I only planned to go to North Dakota, they would be so relieved they wouldn't fight with me about it. It worked. 4) I'm fluent in Spanish. 5) My sister is named Raphaella, after the great renaissance artist. She got teased a lot as a kid because of the Ninja Turtles. 6) When my brother invited me to have a double-wedding with him, I refused. 7) In a past life, I was Luke Skywalker, and I blew up the Death star. Feel free to guess away! I'll let you know the facts tomorrow! And I'd like to pass this award on to my friend SQRT(D) at Dmitri Demidov's MEAL who will no doubt have some way more entertaining items on his list than I had on mine. Oh I am so bad at guessing. Let's go safe with #7. lol! Just kidding. #4. Can't wait to hear the truth! I liked thinking that any of the first six were completely plausible and I just can't tell which is the truth. I'm really awful at these. As much as I want #7 to be true, I'm going to guess #2. Can't wait to find out the truth. It seriously took me more than an hour to come up with these-- and that's with the Luke Skywalker bluff at the end. I had to call in reinforcements and ask for help, so I'm glad you guys enjoyed it! Killer Whales: As Smart As Chimpanzees? The Sweetest Giveaway I've EVER Seen!